Throughout the month of May I have been able to connect with a variety of others to help inspire you on your journey of the 31 day happiness challenge. Kylie over at Kidgredients shared with me that her favorite thing to do for self-care is cooking. To prepare for Mother’s Day, she is sharing a great recipe for your family to make YOU! The ultimate day to make Mum smile. For that reason, Mum I want you to stop reading now. I want you to immediately send this link to: whoever is being tasked with making your day special this weekend. If it’s the teenagers, the significant other (be it husband, boyfriend, fiancé, whatever) or even the little kiddies…whoever it is, get them ready. But Mum, I know you’re still reading…. 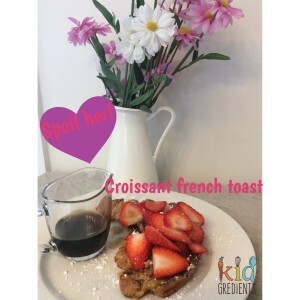 If you’ve ever read my blog, http://kidgredients.com.au, you will know that I’m all about healthy kids and family foods. But today, just for you I’m all about special treats for the special Mum in your life. Don’t tell my regulars…because we are going to be doing something naughty. I had planned on doing some baked eggs in toast with bacon and sundried tomatoes. But as my husband kindly pointed out, he wouldn’t know where to find a muffin tray, so he doubted this was the way to go as there would be many Dads who couldn’t find the muffin trays. Breakfast in bed. Yep. So last year my daughter (3) made me breakfast in bed. Then she climbed into bed with me and ate the toast she proudly cooked for me. This recipe makes enough to ensure the kiddies and Daddy won’t miss out. First step: gather your supplies. You need a whisk, a spatula, a jug and a frypan. Cut the croissants in half. Combine the egg, milk, sugar and cinnamon in the jug and whisk. Heat ¼ of the butter in the frypan over medium heat. Dip the croissant in the egg and milk mix. Fry the croissant until golden on all sides. Top with the strawberries, drizzle with maple syrup and sprinkle with icing sugar. Deliver to mum in bed. 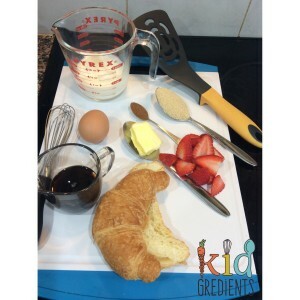 Kylie blogs at Kidgredients, a blog all about kids and family foods. She’s a mum to 2 mini Kidgredients, Miss 4 and Master 2. She regularly posts her kids lunchboxes on facebook.com/kidgredients where she also shares lots of kitchen hints and tips. This entry was posted in happiness, self care and tagged #happinesschallenge, #intentional living, #selfcare, mommy self care. Looks so yummy! What mother wouldn’t want this for breakfast. Starla J @ Pressing In and Pressing On recently posted…11 Tips on Raising a Confident Daughter.